Credit to image used in pin goes to The Seaweed Bath Co., xhorizon, Pinky Up, Zando, Sven Home, Rosebud, Home_Dress, Bando, Amazon, and Pixnor. – Changes were made to the original image. It’s that time of the year again when you’re feeling generous, but worried about how Christmas will affect your finances. You have a long list of people to buy gifts for and your budget is pretty tight. Thankfully though, there are plenty of budget-friendly gift ideas that don’t look cheap. They’re all affordable yet look stylish, expensive, and functional. Any women in your life will love these ideas. So check out this gift guide and make the best of your holiday budget. Also, let me know what you think! Make your loved one’s morning extra magical with this unicorn mug that looks perfect for coffee or hot chocolate. It comes both microwave and dishwasher safe so there’s nothing to worry about. 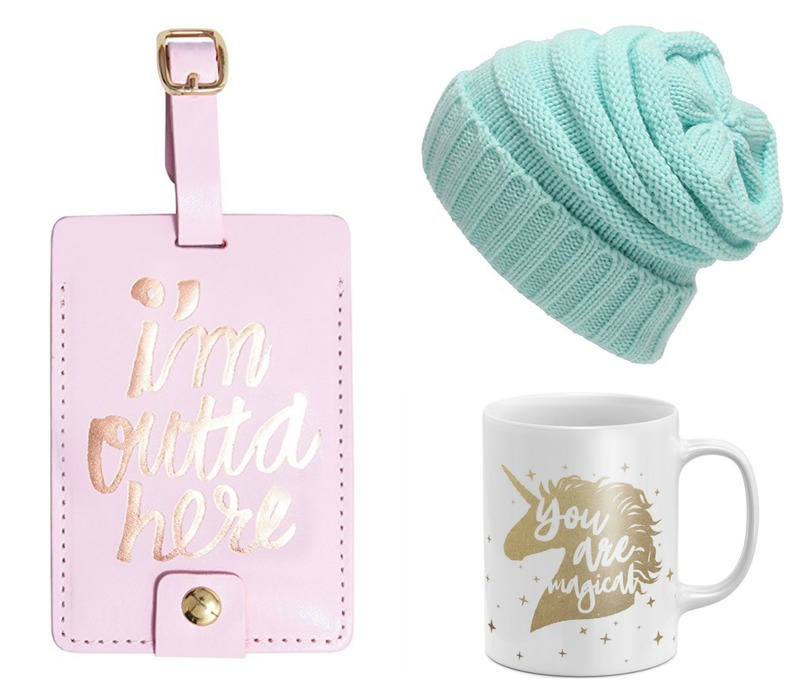 Give this to someone who’s a unicorn lover; they’ll definitely love this. You can easily get one here ! This gold pineapple bottle opener is a great present for anyone who loves non-alcoholic and alcoholic drinks. Whether they use it for opening a wine bottle for a recipe or soda, they’ll definitely fine it cute but practical! You can easily get a bottle opener here ! Whether she’s a nomad or likes to travel once in awhile, she can easily see her belongings. Plus it gives a nice chic and stylish look to her suit case, so it’s a total win. You can easily get a luggage tag here ! Another great gift for your traveling friend is this cute and functional passport holder. It keeps things organized inside and gives a fashionable look on the outside. If your loved one’s favorite seasonal activities include skiing or playing in the sun, her lips are bound to get chapped. So you might want to think about gifting this lip balm. You can easily get a lip balm here ! Of course, who wouldn’t want to have cute knitted beanies in this chilly season? They’re a cold weather staple that completes a winter outfit. If you’re still looking for a cheap but great gift for your mom (or other family member), then definitely get this super cute tartan shawl! You can easily get a tartan shawl here ! This ceramic tea tray is versatile and can be used not just for your tea time but for cookies or even jewelry! They’re honestly such a cute addition to anyone’s kitchen, bedroom, or bathroom! You can get one here ! One of the most useful and functional gifts you can give to anyone is a wallet. It secures the money, cards, and ID’s that you need for everyday living. Also, this wallet is just plain cute! You can easily get a wallet here ! This body cream is an ideal gift for anyone who wants you to feel relaxed in this holiday season. It’s convenient, handy, and travel-size for vacations or storing in a pouch. While there’s no doubt that Christmas is the most expensive holiday of the year, having this cheap gift guide will definitely make your wallet happy. They make great gifts to anyone without breaking the bank. Now if you have any $10 (or below) Christmas gift ideas yourself, let me know in the comments down below! I’d love to hear about them!